Food is in everyone´s thoughts, eating is one of the most common social activities in almost any culture around the world. One of the most curious things in life is in fact that we have to stop constantly whatever it is that we are doing, to focus all our attention in eating. We love to eat. No one can deny this fact..
Food is in everyone´s thoughts….eating is one of the most common social activities in almost any culture around the world. One of the most curious things in life is in fact that we have to stop constantly whatever it is that we are doing, to focus all our attention in eating. We love to eat. No one can deny this fact. As you may already know, in most of the civilized world, the abundance of food together with bad nutritional habits, poor nutritional education and lack of physical activity have caused a very large problem: obesity. 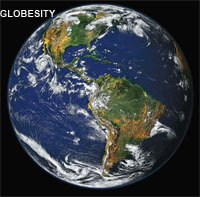 Obesity is now a worldwide public health problem: an epidemic termed “globesity”. In my view, is perhaps the worst disease humankind had to face in their most recent history, since the numbers are simply unbelievable: more than one billion people suffer from overweight, from which more than 300 million are actually obese. Heavy problem indeed. Never better said. Because eating is an activity in which we all take part, it is not surprising that almost everyone has an opinion about this matter. Obese people, who are already subject to serious adverse effects, are additionally victimized by a social stigma predicated on the totally absurd concept that weight can be controlled by “deciding” to eat less and exercise more. Yes, some people believe that obesity is simply the result of a fundamental lack of discipline on the part of affected individuals. This view is often underlined without no doubt by the diet industry, which of course has a financial interest in promoting the concept that the only thing separating an individual from having “the perfect body” is the implementation of a few “little secrets” that can be easily provided by a company or a book author for a very “modest” price. Everyone reading these lines perfectly knows what it feels to skip a meal or to avoid enjoying a really nice big slice of cheesecake… from this common experience comes the conclusion that obese people simply have “less will power” and fail to restrain themselves less well than the lean people. The problem with this view is that completely ignores all the substantial evidence that proves the existence of a powerful biologic system that maintains body weight within a relatively narrow range. Furthermore, predisposition to obesity is to a significant extent, genetically determined. More than 90% of individuals who lose weight by dieting eventually return to their original weight. Do you want to know why ? The answer is actually quite simple: because body weight and body fat are physiologically controlled and a change in any direction will trigger a very potent response that resists such change. Voluntary efforts to reduce weight are resisted by potent compensatory biologic responses. Over the course of a decade, the weight of an average adult tends to increase slightly (provided that eating habits and physical activity do not change dramatically during this period of time). Approximately 10 million kilocalories are consumed over this time. In order to account for the modest change of weight that is generally observed in most people, food intake must precisely match energy output within 0.1% per decade! This extraordinary level of precision clearly shows that a very complex biological system is responsible for the balance of energy input and energy expenditure. So, even if voluntary changes in behavior can often produce a short term weight change, all the available scientific evidence to date suggest that over the long term the neural centers that control appetite will overcome motivational factors and the lost weight will eventually come back. What then determines when we eat and how much we eat? Feeding behavior is quite complex and depends upon many factors, including olfactory, visual, emotional and higher cognitive inputs as well as other nutritional signals. As the decision of whether or not to eat is the result of neurochemical events in the brain, there are integratory centers that balance this delicate mechanism. We can summarize the previous paragraphs by saying that obesity is the result of genes interacting with environmental factors. Our environment has changed in the past century so fast that our own genome has not had enough time to adapt to the new conditions of food abundance. Since obesity is such a common problem, there are thousands of available remedies trying to solve the problem. Hippocrates wrote 2,000 years ago that the obese should “eat only once a day and take no baths and sleep on a hard bed and walk naked as long as possible”. In current times, obesity research is one of the most dynamic areas in biology and is linked with physiology, neurobiology, biochemistry, bioenergetics, genetics, nutrition and others areas of science. One new article related to obesity is published in a scientific journal every two hours, this gives you an idea of the dimension of the problem and the amount of available information. We live in an era in which advances in medical research sound like alarms almost every hour reaching people in most developed societies almost instantly, through tools like the internet. It was in the internet where a very trendy concept just came into my attention. It is called “intuitive-eating”. Dr. Steven R. Hawks from Brigham Young University in Utah (U.S.) is one of the main leaders of this anti-dieting concept. He suggests that instead of manipulating what we eat in terms of prescribed diets (how many kilocalories and grams of fat a food has, etc), we should simply recognize what our body wants and then regulate how much we eat based on hunger and satiety. Intuitive eaters only eat when they are hungry, don´t feel guilty about what they eat and stop eating when they are full. Proponents of intuitive eating for weight management believe that all individuals possess a natural mechanism that if allowed to function will ensure good nutrition at a healthy weight. Therefore, it is possible to maintain a healthy body weight while maintaining an unrestrained relationship with food. So basically, we just need to close our eyes and our inner wisdom will tell our body what is best for our nourishment. Right. Hawks says that “what makes intuitive eating different from a diet, is that all diets works against human biology, whereas intuitive eating teaches people to work with their own biology, to work with their bodies, to understand their bodies”. I agree with this: personal worth has nothing to do with body size, but personal health is a whole different issue, isn´t it ? The second behavior intuitive eaters should learn is “how to interpret body signals, cravings and hunger and responding in a healthy, positive, nurturing way”. And how exactly can a person know what is nurturing and what is not ? They close they eyes, ask for a wish and their inner wisdom hands out a list ? I feel very scared every time I read this sort of pseudo-scientific proposals in a newspaper, the internet or in a magazine. This intuitive-eating is quite trendy in America lately, as a matter of fact, they have a “National Institute for Intuitive Eating” where they are offering courses to people: 3,000 dollars for a 7-day course (that includes meals). I can understand why this is happening: people is more aware than ever that both overweight and obesity are a real problem and they just want an easy way out. As I already pointed out in my article “[url="#"] Diet Wars[/url]”, people is always looking out for new “effective” options for reducing weight. The problem is that most people, regardless of their education level, understand the concept of “diet” in the wrong manner. Do you know what diet really means ? It comes from the Latin diaeta which originated from the Greek diaita which literally means: manner of living, life-style… and this term was promoted mainly by Pythagoras and his disciples. Yes, if you look in the dictionary will say that diet is “food or drink regularly provided or consumed; habitual nourishment”, but what actually means is “the way we live”. DIET is not something you do for 2 weeks or 2 months to get rid of 2 or 20 kilos. That is what the food industry has forced you to believe. DIET is much more than that; is the way we should live in order to reach (or at least try) a good health and this includes not only a healthy selection of foods and the right way to combine them but also something very important that Dr. Hawks forgot to mention: exercise! Yes, ladies and gentlemen, exercise is part of our daily diet as well, and this is why the most recent dietary guidelines for adults and children put a lot of emphasis in the aspect of daily physical activity. So, even if genes are involved in a conspiration against your own body, working together with your metabolism to prevent you from losing weight, there is still light at the end fot the tunnel ([url="#"] click here to see the light[/url]), and by habit the right nutritional habits, an adequate balanced diet and a good level of daily physical activity is possible to battle against obesity and win the war. Even severe obesity is treatable and reversible. Nutrition is a very complex and broad branch of science. And acquiring scientific knowledge requires a lot of time, discipline and dedication. Nutrition is much more than just keeping the right weight: You can have your ideal weight but still have a very bad nutritional status! Eating is something you can certainly do on your own, is like driving a car. Knowing what is the best way to become properly nourished is not something you can do on your own, unless you are a professional trained for that. It is like flying an airplane. Someone needs to do it for you. Flying an airplane is not driving a car, don´t let anybody tell you otherwise. And don´t try it on your own, cause you may end up crashing…. Leave your nutritional health in the hands of professionals. On the hands of SERIOUS professionals. I am already thinking of opening a center to teach this to people, would be free of charge and it will be called: National Institute of Common Sense. You are welcome to join in. So the final message is this: I believe that the only way to bring nutrition knowledge closer to people is through education. Education that should start since we are children. But we also need to offer better nutrition and counseling education for medical practitioners. Most modern schools of medicine in the planet do almost nothing to train future doctors in the art of nutrition, doctors that in the future will be dealing and treating people with nutrition-related problems. As a result, these practitioners are very poorly equipped to give advice to their patients and often, they are way too proud to refer them to another health professional, such as nutritionists, to provide better nutritional advice when they fail to do so. But the most important is the first requirement I mentioned: nutritional education of the public at large. Although health education takes time, it ultimately can be a powerful mean for changing population habits. We have seen this in the past two decades with regard to smoking. With solid evidence that smoking damages your health, the campaign to educate public has been gaining ground year by year in the last two decades. This gives me hope. I am confident that all the efforts being done right now by few optimistic professionals in each country, trying to provide a solid nutritional education to people, will start producing results before this decade is over. We love to eat. That love was born at first bite. Old habits die hard, but we need to embrace a new kind of love: The love to eat right. You can´t say that you live good unless you eat good. After all, better nutrition means better health and ultimately, a better life.